The Gainesville Times has an interesting report about a local controversy. Here is how the report, “Water War” (October 2nd edition) begins. The water war pits members of the Prince William Board of County Supervisors from the west end against those on the east end. What’s the bone of contention. Oddly, it’s just a swimming pool. Unfortunately, big swimming pools do cost a lot of money. Thus Supervisors Wally Covington and Peter Candland complain about debt. Of course, no one would seriously argue that it would not be good for our children to have a pool. The immediate problem is one of priorities. When the School Board has so many other more important priorities, why would they want to spend money on a swimming pool? The answer, of course, involves politics. Whenever we run into a situation where our priorities have become so obviously skewed, we should stop for a moment to take stock of the situation. How did our School Board get to the point where its members would seriously consider borrowing money for a swimming pool? Why do we have a public school system? There is no single answer for that, but Horace Mann (May 4, 1796 – August 2, 1859) gets much of the credit. Mann was a New England politician who industriously pushed the idea of public education. However, New Englanders established the foundation for public education long before Mann arrived on the scene. They were already building public schools in 17th Century (History of education in the United States). So what went wrong? The problem seems to be one of mission creep. Since politicians both like solving problems and spending other people’s money, politicians perpetually seek new problems to solve and new excuses to spend other people’s money. Consider. 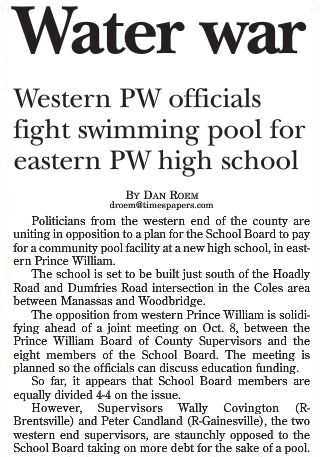 Prince William County already has a government agency responsible for building fabulous swimming facilities, Parks and Recreation (see Swimming), and they are still building pools (New aquatics center opening in Manassas). So why does the school division need to get into that business — because they can? Initially, public education was strictly a function of local government. Then state governments got involved and now the Federal Government is trying to take over the public school system. Why? Where is the evidence that either state governments or the federal government has done anything except waste huge sums of money? What happens when any function of government gets moved up the food chain? Doesn’t it make it harder for local citizens to provide input? Even though we still retain a local school board, don’t board members have to answer to state and federal regulatory officials? Has our school board discovered something wonderful? State and federal officials don’t regulate school pools? Oops! The Prince William Board of County Supervisors still has a say. What is the basic justification for a public school system? Wasn’t the idea to make certain every child received a basic education, the knowledge and skills required to provide a foundation for future learning? Did that ever require government to run an education system designed to educate every child? Do we really want politicians doing that? Why? Look into America’s early schools. Here a couple of brief histories. Prior to the advent of education activists such as Horace Mann, parents had relatively unfettered control over what their children learned. Then movement to build government-run schools took off. Unfortunately for the politicians, compulsory education in government-run schools created a problem. We do not all share the same religious beliefs. So how did politicians solve that problem? Well, they did not give up control of either solving the “problem” or that money they wanted to spend. Instead, they sought to resolve religious freedom issues by trying to eliminate the subject of religion from the curriculum. Thus, politicians thoughtlessly promoted another religion, Secular Humanism. 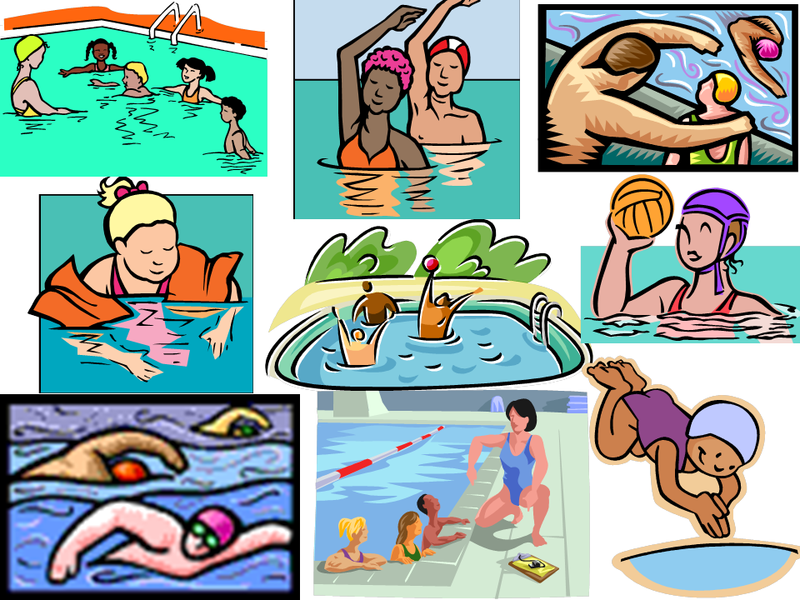 This entry was posted in Citizen Responsibilities, Constitutional Government, culture, history, Local News, religion, School Choice and tagged constitution, education, Horace Mann, human-rights, Peter Candland, Prince William Board of County Supervisors, Prince William County Virginia, school board, school-choice, Secular Humanism, Supervisors Wally Covington, swimming pools. Bookmark the permalink.